I can ORDER NOW at a special discount price and SAVE $20! "Talk about opening up my mind and raising my vibration. I was floating on cloud nine. It really helped me feel very clear, and a lot of things made more sense to me. As if I can see with the eyes of Spirit even better. I can't explain it… It was really something else!" 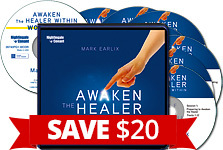 Please send me Awaken the Healer Within by Master Healer and teacher Mark Earlix. I understand that I'll receive 7 CDs and a PDF workbook on CD for $119.95, which is $20 OFF the regular program price.